Every region of the US has it’s list of specialty foods, and New England is no exception. We all know about the New England style hot dog roll, the Lobster Roll, the clam strip, and Boston baked beans. 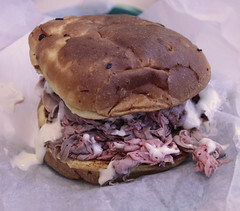 Slightly less well-known is the area’s love of the roast beef sandwich, with several layers of steaming, rare roast beef piled upon a heavy onion roll, preferably with some sort of horseradish condiment. Think Arby’s, but done with actual meat and decent buns. 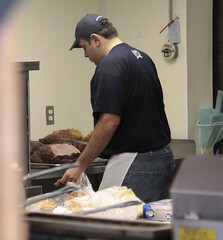 The north Boston area (the North Shore, in particular), is rife with various roast beef sandwich shops, ranging from the regional chains (Kelly’s Roast Beef) to several other establishments, such as Liberty Bell. Royal’s, Bill and Bob’s, Beachmont. I’ll be honest, I’ve not done a full tour of these, but I’ve been to Kelly’s several times and Bill and Bob’s once, and I’ve generally been very happy. 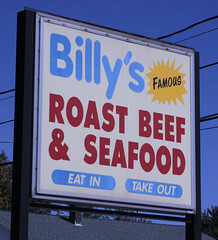 But several places that review these little roast beef stores all mentioned one place in particular as standing out amongst the rest: Billy’s Famous Roast Beef in Wakefield, MA. So on a recent trip to the north Boston metro area, we decided to stop in an try them out. Located right on the line between Melrose and Wakefield, it’s a small family-run establishment with a simple ordering counter and a line of booths. The menu is primarily roast beef sandwiches, fried seafood, and your basic sides (fries, onion rings, etc). Carol and I both opted for a “Super Beef” with horseradish, and split a side of fries. We watched them make the entire sandwich, pulling a roast from a holding oven, slicing it to order, toasting the buns, and assembling the sandwich. The beef was very nicely roasted and juicy. I like it a titch rarer, but this wasn’t overcooked by any stretch, and was nicely pink. It was sliced very, very thinly, and piled on generously, resulting in all sorts of beefy goodness piled up on a bun. The bun itself? Basic onion rolls, but fresh, soft, and nicely toasted, which kept the bun from getting completely destroyed by the juicy beef. Overall, I’d give this a 9/10 on my beef sandwich scale, and certainly wouldn’t mind coming back, this place has definitely earned it’s reputation for beef sandwiches. So, I heartily recommend Billy’s for a Roast Beef sandwich. I’d pass on the sides, however. When my brother moved to London back in 2008, I thought it was neat that the building he lived in had a pub right downstairs. Problem was, that particular pub, the Pimlico Tram, was actually a lousy pub with a not terribly great clientele. But then something marvelous happened: the Pimlico Tram closed, and instead pub owner Martin Hayes refurbished the place and re-opened it as the Cask Pub and Kitchen. And, practically overnight, the lousy pub downstairs became the hip new pub downstairs, with a particularly good selection of British and imported beers, eight hand-pulled handles, and a reasonably good selection of pub grub. And starting that year, they’ve continued a run of excellence, with several awards including multiple winnings of The Publican Magazine Pub of the Year, Great British Pub Awards’ Best Cask Ale Pub in London, and CAMRA’s West London Pub of the Year. Enough so that I can’t even keep track of it. Meanwhile, they’ve been expanding, including more beers on tap, and, more importantly, sister pubs, with several locations of the Craft Beer Co open throughout Greater London (Craft is basically the same concept as Cask, but without the food). I hadn’t reviewed Cask before, since I generally don’t review pubs unless there’s something particularly notable about them or their food, and, quite frankly, I hadn’t been terribly impressed by Cask’s pub food in the past. However, starting in 2012, Cask significantly re-tooled their menu. On Sunday nights they still do the traditional “Sunday Roast”, but the rest of the week their kitchen transforms into Forty Burgers.